1. Lay baby on your chest or tummy and chat to her, enjoying some face-to-face interaction. 2. Hold baby on your forearm. This position is also known to ease gassy babies and relieve discomfort. 3. After baby gains more head control, use a tummy time pillow to prop him up. 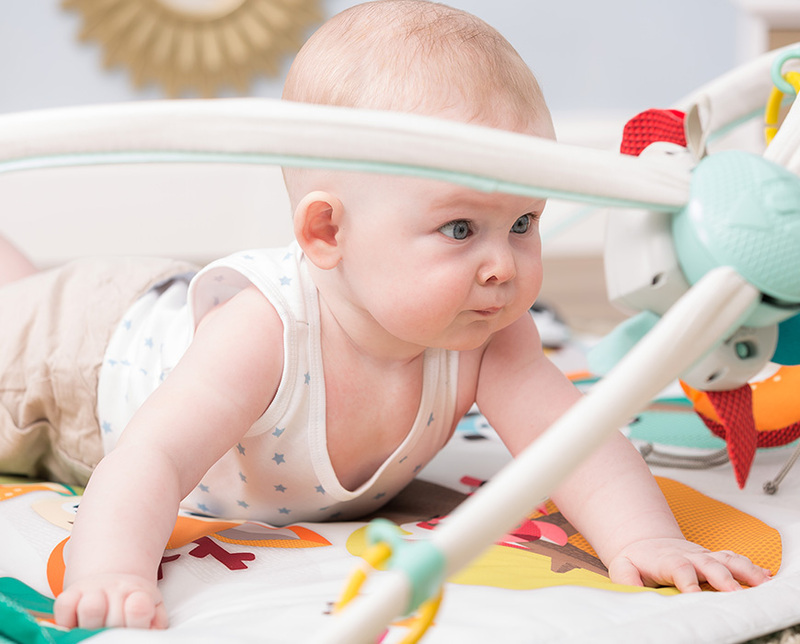 Experts recommend that you allow baby 30 minutes of tummy time every day. Starts off with short periods of tummy time (2-3 minutes), keeping in mind that it is a real effort for babies in the first couple of weeks. 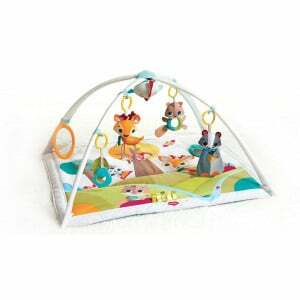 As baby grows stronger, allow longer stretches of tummy time and try to amuse baby with songs, chatting and engaging toys. 1. 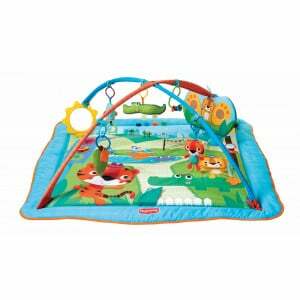 Link tummy time with activities baby is familiar with to make it more fun for baby. 2. Lay your baby on his tummy on a soft blanket several times during the day. The blanket should not be too soft, so that your baby doesn’t sink into it. Begin with very short periods, releasing baby from the position once he begins to complain. 3. As time passes, extend baby’s tummy time by placing eye-catching toys with bright contrasting colors or lights in front of her. Tiny Love has a wonderful selection of products that can help stimulate baby while on his tummy, such as the Double-Sided First Book. 4. Place a rolled-up towel under your baby’s chest and help him place his hands on the floor. • Try to get some tummy time into your baby’s schedule whenever you can, holding her in the recommended positions that exercise her neck and shoulder muscles. 5. Never leave your baby unattended while practicing tummy time.